TIS' ST. PATTY'S DAY AND ALL IS GREEN AND LUCK IS ABOUND. 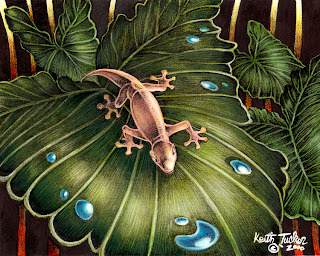 DID YOU KNOW THAT IN HAWAII IT'S CONSIDERED LUCKY TO HAVE A GECKO IN THE HOUSE? WITH OVER 900 SPECIES OF GECKO'S ACROSS THE GLOBE, ONLY EIGHT LIVE IN THE HAWAIIAN ISLANDS. THROUGHOUT THE HAWAIIAN LEGENDS THERE IS THE "MO'O", A MYTHICAL DRAGON. THE MO'O IS ONE OF THE OLDEST GUARDIAN SPIRITS KNOWN AS "AUMAKUA". LIKE THE SHARK, OWL, AND THE HAWK, THE MO'O WERE NOT EATEN OR HARMED. THE GECKO WAS BELIEVED TO HAVE BEEN A MANIFESTATION OF THE MO'O DRAGON, AND TO HAVE SUCH A GUARDIAN IN THE HOME WAS AND STILL IS CONSIDERED TO BE GOOD LUCK.